Camp Shred is a design geek's dream come true, where all the biggest surfboard manufacturers set up shop side-by-side, allowing you to peruse their wares, talk shop with shapers and reps, and take any eye-catching craft for a spin at one of several breaks located just a stone's throw away. Much like the throngs of attendees that came down to the San Elijo surfcraft smorgasbord, the SURFER staff tried to milk the event for all it was worth, testing out a multitude of designs in the playful local reefs. Below are some of the boards that left a lasting impression with the team. 5'5" x 20" x 2 1/4"
The waves surrounding San Elijo campground this weekend were mostly soft, chest-high rollers punctuated by a few bowly sections—ideal for a fish, or its ilk, basically. So when I saw this stubby twin fin with ironing-board rocker and swallow tail, I knew I'd found my date to the dance. DHD managed to pack 28 liters of foam into this thing, much of it residing in the front third of the board, meaning the Mini Twin paddles and catches waves like a dream. That foam also allows the board to carry speed incredibly well through flat sections, which helps you to connect the dots, fluidly smacking sections as the pop up rather than bogging rail or Huntington hopping your way through the in-between moments. The back third of the board has a bit more curve in it than a traditional fish, as well, which gives it decidedly better turning ability than the designs it's inspired by. Coupled with Futures Akila fins, the Mini Twin had a surprising amount of drive and hold through turns. At no point did the board feel liable to slide out in the wrong place, like, say, mid bottom turn or the deepest part of a cutback, which I've experienced with other twins in the past. But sometimes sliding around like you've stepped on a banana peel in an ice rink is exactly what you want from a twin fin, so I could see how having at least two sets of fins would help you get more versatility out of the board. Hypto Krypto, deck, profile, and bottom. 5'4" x 19 1/4" x 2 3/8"
Remember that band you used to love, back when they were relatively unknown, on an indie label, and playing your local dive on Friday for five bucks? You couldn't get enough. Well, until they signed with a major label and exploded onto everyone's Spotify playlist from here to Tokyo. That's when you jumped off the bandwagon. Surfboard designs are kind of like that; revered in backyards and then unfairly judged when they make it to the mainstream. And while the Hypto Krypto has been around for awhile, I avoided it entirely until this past weekend at Camp Shred. The Hypto is largely responsible for putting Haydenshapes on the map, and I quickly realized that was for good reason. I rode a 5'4" version in slow, high-tide Cardiff campground rights, and I didn't want to come in. The FutureFlex technology (a stringerless, epoxy construction with carbon fiber rails) makes the board ride more like a traditional polyurethane board than an epoxy in terms of float and feel through turns. And while this particular Hypto was only a 5'4", and my normal shortboard is a 5'9", it was very responsive, predictable, and didn't feel fishy at all. 5'3" x 17 3/4" x 2 1/8"
Full disclosure: the waves were less than average when I paddled out in front of the San Elijo campground during Camp Shred. The tide was completely drained and it seemed like all of the energy had been sucked all the out of the lineup with a vacuum. So when I made my way into the lineup on the Slater Designs Sci-Fi, I had already resigned to the fact that this wasn't the ideal situation for a test drive. The first thing I noticed about the Sci-Fi was how much lighter it felt than my normal shortboard. But after paddling around and catching a few waves, I was surprised by how well the board floated and got on plane—especially considering how mushy the conditions were. I didn't have to scratch into waves, nor did I have to perform the bunny-hop to get through flat sections. According to Chris Grow, the host of Firewire's The Wire podcast, whom I spoke to after my session, it's the design in the tail that helps create this buoyancy, even in small surf. 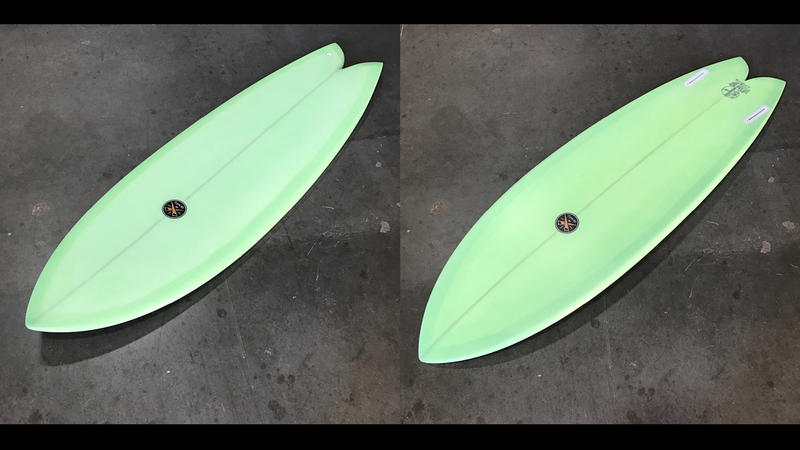 Compared to a more drawn-in tail on a standard shortboard, the Sci-Fi has a fairly wide tail, which helps with flotation and allows the board to plane better, as long as your back foot is placed correctly. 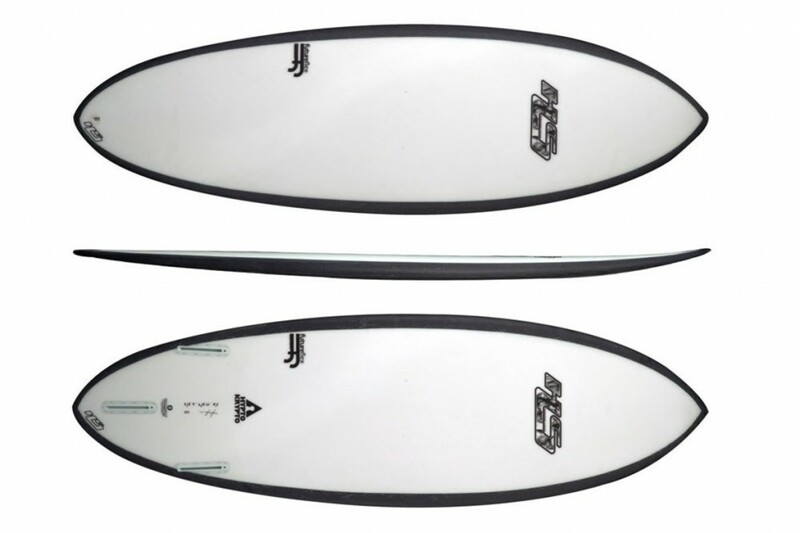 The tail is likely the reason for the board's name, featuring a futuristic-looking double-bat shape, which, according to Grow, allows the board to grip the face of the wave better through turns and avoid sliding out. Fried Fish, deck and bottom. 5'7" x 20" x 2 1/2"
Faced with soft swell and slow-rolling conditions at Cardiff, it was a no-brainer to grab a shorter, wider board that offered a better chance of making a tasty batch of lemonade out of the lemons in the lineup. Upon perusing through the mass of surfboards piled up in the Surf Ride tent, I found myself drawn to a colorful batch of twin fins. A bit shorter, wider, and thicker than my standard shortboard, the Fried Fish looked like it could provide the cruising capability I was aiming for. In the water, the board had extremely good hold for a twin fin. It held rail through cutbacks, foam climbs, and high lines much like a thruster. Frontside and backside, the groovy, wide-point-forward stick gained and maintained speed well through the soft conditions, but it didn't slide out, nor did I have to nurse it through turns, or take it slow by any means, which isn't normally the case when I ride twin fins. At one point, I actually flipped the board over just to double check that it was, in fact, a twinnie.